When you tell your unconscious mind what to do, you’d better speak its language! What divides those who achieve their goals from those who don’t? Yes, we all know the mind is powerful. And yes, we all know we should “think positively.” Well, the biggest lie in the personal development field is that that’s all you have to do. If you can dream it, you can do it! No?… Well, maybe. Being able to imagine achieving a goal is important–but it’s not enough. We all know people who can dream their goals until they’re blue in the face. They dream for years and years but never reach their goals! It turns out, just dreaming about things isn’t necessarily enough to get them. You’ve got to be more specific about how you imagine your goals what emotions to attach to them and how they affect the rest of your life. The answer comes from NLP. 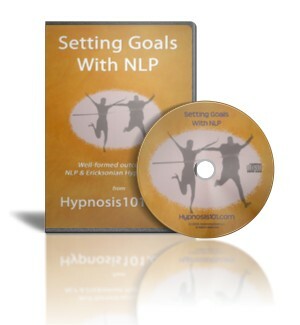 NLP studies the world’s greatest achievers. As it turns out, these folks think about their goals differently than other people do. Achievers massage their goals–they make sure the goals fit a certain format before they start dreaming about them. In other words, dreaming is not enough. You’ve got to dream a certain way! NLP calls dreaming this way well-forming an outcome. Well-form an outcome and that goal becomes compelling and believable. Your unconscious drives into achievement mode. It’s what I use with clients. I well-form goals with almost every client that walks through my door. It not only helps them get sustained motivation, but it gives me an incredible amount of information as to what’s going on in their minds. Instant access, downloadable, no shipping cost, environmentally friendly.